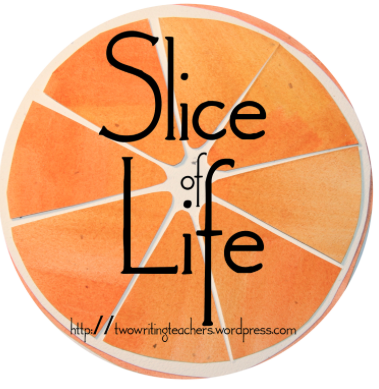 Several years ago, hunting for ways to teach kids about specificity in writing, I came across the William Carlos Williams' quote, "No ideas but in things." (I think I found it in something written by Nancie Atwell, but I'm not positive what). I used the quote for a whole series of mini-lessons, again, I think, based on some ideas I found in Nancie Atwell's work. I thought of that quote, when I ran across a new poetry anthology a few weeks ago at Tattered Cover. 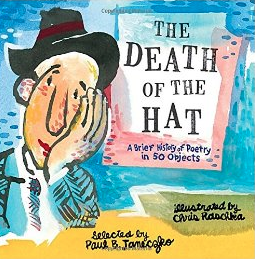 THE DEATH OF THE HAT, selected by Paul Janezcko, is a collection of poems about common, ordinary, every day objects. The poems are organized chronologically, grouped into nine different time periods, beginning with the Early Middle Ages, and progressing through the Renaissance, Modern poetry, Post Modern, and Contemporary. There are well-known poets- Rumi, William Shakespeare, Yeats, Carl Sandburg, William Carlos Williams. And some poets I had never heard of. There are twelve poems by women, beginning with Eloise Greenfield and including people like Phyllis Wheatley, Christina Rossetti, Sylvia Plath, Mary Oliver, and Rita Dove. There is a really terrific introduction by Paul Janezcko, who briefly discusses some of the characteristics of each era, as well as the challenges of selecting the poems. The book is illustrated with watercolors by Chris Raschka (who happens to be my birthday twin, we were even born in the same year!). I think it would be interesting to ask kids to make collect an anthology of object poems. Or poems about a specific object through the ages. A really nice addition to an intermediate grade, middle or high school poetry collection. OK, I'll admit it. I'm a Cynthia Lord groupie. And I have been since the publication of RULES in 2007. I've read all of her middle grade novels- RULES, TOUCH BLUE, HALF A CHANCE. And I've been hearing snippets about her newest book, A HANDFUL OF STARS, for at least six months, maybe even a little longer. I kept trying to win it in a contest, but it didn't happen. So finally, a couple of weeks ago, I broke down and pre-ordered it. It came over the weekend, and I pretty much devoured it in one sitting. I loved it. For starters, it's set in Maine, one of my favorite parts of the world. 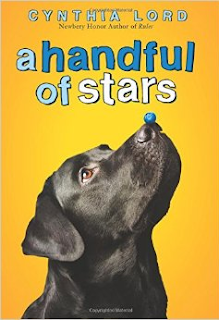 And one of the main characters is Lucky, a sweet black lab who has that little bit of naughtiness that seems to be inbred in every black lab I've ever owned. Lucky is blind, and his owner, Lily, is trying to earn the money for him to have a cataract operation, so he will be able to see again. When the book opens, Lucky has gotten loose, and Lily is chasing him across the blueberry barrens. Lucky is captured by Salma, a migrant girl about Lily's age, whose family picks blueberries. Salma and Lily become friends, and soon she is helping Lily paint bee houses (which I had never heard of) to raise money for Lucky's operation. Through Lily, Salma learns about the town's Blueberry Festival. She decides to enter the Blueberry Queen Pageant, because the prize is a savings bond, which she could use for college. But Salma doesn't look anything like the typical Blueberry Queen. And people in the town aren't sure that a dark-eyed Hispanic child, who is not even a local, should win the prize. A terrific middle grade about friendship. And prejudice. And saying goodbye. Once there was a girl who was moving to a new town. in the morning and the crickets that sang at night. But most of all, she was going to miss the butterflies. 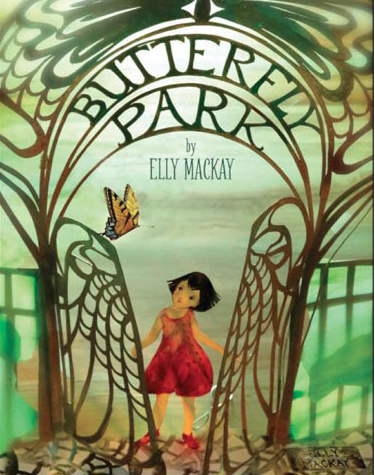 When the little girl arrives at her new home, she discovers that she lives right next door to a magical gate labeled BUTTERFLY PARK. Unfortunately, when she goes to visit, there are no butterflies. She and a neighbor catch a butterfly and takes it to the park, but it doesn't stay. After several more tries, with the same results, she follows the butterfly, and discovers that the butterflies are searching for flowers. The little girl brings a bouquet to the garden, but that isn't enough. Her neighbors arrive with "boots and gnomes and gardens and trowels and dirt and shovels" and together, they transform the park into a magical place, depicted in a beautiful fold out spread, where butterflies really do want to live. The illustrations in this book are fascinating. They look like collage, except they are 3-D. Of course (because I have nothing else to do in the last two weeks of school), I had to go to author/illustrator Elly Mackay's website, to see if I could learn a little more. On her website, Mackay describes her style as light box photography or paper theater. You really need to go to her website and check out her process! It's super interesting and might be a great project to try with kids, especially this last week of school, when they just need something totally wonderful to capture their minds and hands! This would be a terrific read aloud in a unit on butterflies or ecosystems or community activism or how one person can make a difference! It all started with THERE IS A BIRD ON YOUR HEAD. I read it to the first grade one day when Kathy, their teacher had to leave early and I was covering the class at the end of the day. 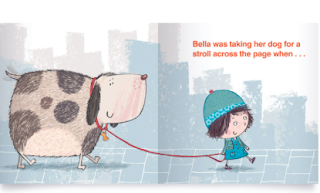 You probably know BIRD- it's one of the earliest in Mo Willems' Gerald and Piggie series. It's also one of my favorites. I can read it to first graders. And fourth graders. And even eighth graders. It's just silly funny. And fun. It makes me laugh. And it makes the kids laugh. So I read it to the first graders. A few weeks before they started our district's first grade author study. Who happens to be Mo Willems. And it started something. The first graders are Mo Willems' groupies! Every time I walk into their classroom, the first graders think I'm there to read Mo Willems. The author study has been over for several weeks, but they won't let Kathy take down the Mo Willems shelf- they're not done with the books. Frantic book waving six-year-olds chase me down the hall to tell me about the Mo Willems' books they found at Reading Rocket (the mobile library that comes to our school every Thursday). They remind me, on a pretty much daily basis, that Mo Willems is one of my favorite authors and now he is one of theirs too. I wasn't surprised, then, when Mo's name came up again last week. I had gone into first grade to pick up a student for testing. I was standing by the reading table, waiting for Kathy to pull her testing materials, when J. approached. "Dr. Carol, does Mo Willems have any new books? Because we have read all of these," he said, gesturing to the shelf containing at least twenty Mo Willems' books. "Umm, I'm not sure, J, but we could probably look on his website and find out. Should we try that?" I sit down and set up my laptop on the reading table. Immediately I am surrounded by ten Mo Willems groupies. They have heard their favorite author's name and want to be included in the discussion. We scan the website. I think new books might be posted on Mo's blog, but they are not. Instead, we discover that Mo has an exhibit opening at a museum in Atlanta. Immediately, the first graders think we should take a field trip. They are also ready to see the Gerald and Piggie play in Chicago. Unfortunately, we do not find any new books. Fifteen minutes later, I move on to my testing. A little later, I am waiting for a meeting with the fourth grade teachers. The Mo Willems' website is still open on my computer, so I poke around a little more. On a page called "Get Mo' Stuff!" I discover that there actually are three new books, one in English and two in Spanish, coming out on June 2nd. And I know we have to have them. Before our last day on June 6th. Just before lunch, I make my way back to the first grade classroom. Kathy rolls her eyes when she sees me coming. I announce my discovery to the first grade and show them the picture of the cover. They are thrilled. "Can you go get it? Will you order it?" they ask. I explain, again, that it won't be available for about ten days. But that I will order it. And we will read it the last week of school. They are over-the-moon ecstatic. And ask me, repeatedly, throughout the week, if I have ordered the book. And when it will come. They even know the title. Our DRA scores are not as good as we had hoped. We still have way too many kids reading below our state's identified proficiency level. At the same time, I'm not that worried. I know these kiddos are readers. I know they will go to the library this summer. I know they will head straight for the Mo Willems' shelf and that they will read and reread and reread his books. I know they will examine the pictures, searching for Pigeon and Knuffle Bunny on every page. I know they will laugh. I know they will come back to school in August and tell me, on that very first day, what books they have read. They are Mo Willems' groupies. Creating groupies. Isn't that what reading instruction should be all about? I love when kids recommend books to me! An eighth grade girl at my school has read every novel in verse I could find, and has now moved on to other things. Her cousin, who is in high school, got LOVE LETTERS TO THE DEAD from her school librarian, and P read the first chapter, then came to school the next day and asked if we had the book in our school library. We didn't, but I found it that night at the public library, and took it to her. She read it, then told me I needed to read it too, because it was the best book she had read in a long time. When the book opens, the main character, Laurel, is just starting high school. Her older sister, May, died at the end of the previous school year and Laurel has elected to go to a new school, out of district, because she doesn't want people asking questions about her sister. 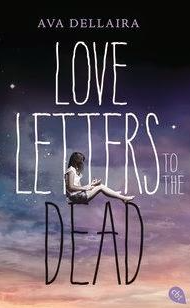 The first week of school, Laurel's English teacher has the class write a letter to a dead person. Laurel writes her letter to Kurt Cobain, but doesn't turn it in. The book, told through letters to people like Janis Joplin, Judy Garland, River Phoenix, and Amelia Earhart, captures Laurel's first year in high school- her relationship with her grief-stricken father, and with her mother, who has abandoned her and moved to California, her first boy friend, the lesbian couple who become her best friends. Most of all, it captures Laurel's coming to grips with her older sister's death. Nothing is worse than when someone who is supposed to love you just leaves. When we are in love, we are both completely in danger, and completely saved. You think you know someone, but that person always changes, and you keep changing, too. I understand it suddenly, how that's what being alive means. Our own invisible plates shifting inside of our bodies beginning to align into the people we are becoming. Maybe when we can tell the stories, however bad they are, we don't belong to them anymore. They become ours. I probably wouldn't give this to anyone much below eighth grade, but definitely a terrific read for the older teen set! Fortunately, because we have been in a drought the last few years in Colorado, we had six inches of snow in Denver on Saturday night. Unfortunately, the snow was really heavy and wet. Fortunately, I have beautiful shade trees in my backyard. Unfortunately, the snow was so heavy, it brought down a huge tree-sized branch from one of those trees. Fortunately, the dogs were not outside when the huge, tree-sized branch fell. Unfortunately, the tree hit the power lines and pulled them down. Fortunately, the downed power lines didn’t spark or start a fire. Unfortunately, the downed power lines meant I had no heat or electricity. Fortunately Xcel Energy has a 24-hour emergency hot line. Unfortunately there were six or seven thousand people without heat and electricity, all trying to call the emergency hot line. Fortunately, I finally got through. Unfortunately, because there were six or seven thousand people needing help, the wait time of 3 hours was probably going to be extended. Fortunately, it was Sunday and I didn’t have to go to work. Unfortunately, it was Mother’s Day and I had planned to go to brunch with my mother and sister at 11:00. Fortunately, I called after I had waited for almost six hours, because I discovered that I didn’t need to be there for Xcel to restore the power. Unfortunately, I had already missed our brunch reservations. Fortunately, I had finished teaching my last adult class on Saturday morning. Unfortunately, I still had a “Training the Trainers” presentation to do on Monday afternoon from 4:30-7:30. Fortunately, I had finished teaching the adult class on Saturday. Unfortunately, I had spent so much time responding to their work that I had not yet spent much time on the Training the Trainers session. I had most of the day open to work on the presentation. Unfortunately, I needed internet access to do it. Fortunately, the library is open on Sunday and has free internet access. Unfortunately, I had only gotten through about half of what I needed before the library closed at 5. Unfortunately, when I got back to my house, I discovered I still did not have phone service, or internet, or cable. Fortunately, Comcast has a 24-hour hotline. Unfortunately, you have to enter your ten-digit phone number, the last four digits of your Social Security number, your Comcast account number, and your underwear size at least five times before you get to talk to a live person. Fortunately, I had Comcast’s number and could call again. Unfortunately, when I asked to speak with a supervisor, I was mysteriously disconnected. Fortunately, I had time to repeat the process one more time. . Unfortunately, I had to enter my ten digit phone number, fourteen digit account number, last four digits of my social, and underwear size all over again. Unfortunately, I have to proctor for PARCC and can’t take off school. Fortunately, there are also evening appointments available. Unfortunately, Comcast’s idea of “evening” is 4-6 p.m.
Fortunately, my principal is understanding and will let me leave as soon as the kids are gone. Unfortunately, I don’t have much faith that Comcast will really show up. Fortunately, I live fairly close to a copy shop and was able to print the documents I needed for my Monday presentation. Unfortunately, it cost over $50 to do it. Fortunately, my power was restored. Unfortunately, it was a temporary fix, which involved temporarily connecting my house to my neighbor’s power line, and did not remove the downed power liens from the backyard. Unfortunately, the dogs need to go outside several times each day. Fortunately, I have a dog door and the dogs can go in and out at will. Unfortunately, there are still power lines stretched across the ground in my back yard, which means that the dogs can’t use the dog door and every time they have to go outside, I have to put them on their leashes, and walk them around the block. Fortunately, I found five minutes yesterday to call and ask about the downed power lines. Unfortunately, I learned that it could be up to five days before those lines are removed from my backyard. Fortunately, I have internet at school. Because it’s Tuesday, and in spite of everything else, I’m determined to post my Slice of Life. 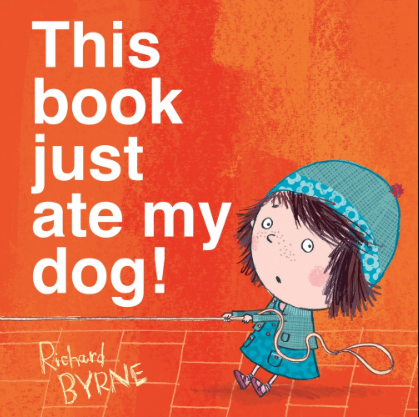 Another new book about reading! This one comes from Belgium! 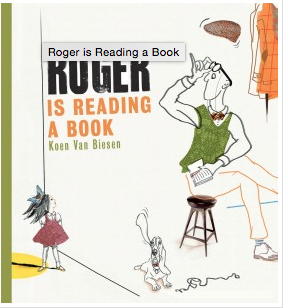 Roger is sitting in his apartment, enjoying the peace and quiet, and attempting to read a book. Unfortunately, his next door neighbor, Emily, has much noisier pastimes, e.g. bouncing a basketball, moves on to singing, playing the drums, and juggling. . Roger knocks noisily on the walls, more than once, but each time, the noise steps for a minute and then starts again. Finally, Roger goes out and buys Emily her own book. The noise problem is solved, but just for a minute. Great, great, great story! Sparse text with wonderful repetition and terrific sound effects! Really fun and different illustration style! A little girl named Bella is taking her giant dog for a stroll across the page of a book, when all of a sudden, the dog disappears. Her friend Ben tries to help, as does a dog rescue truck and several other emergency vehicles, but they disappear too. Bella decides she will have to solve the mystery herself. At 3:50 on Saturday morning I am wakened by the phone. My heart pounds when I see my Son #1's number is in the caller id. "I need you to help me," he says. My mind immediately goes to a dark place. We have been here before. I suspect that he is high and wants money. "I can't find my car"
"You can't find your car?" I repeat stupidly, trying to shake the sleep from my foggy head. "Where are you?" "I'm downtown. Eighteenth and Market. I just got off work and I can't find my car. Will you help me?" I mentally map out my options. I could just leave him there. I could call him a cab. I could call the police and see if his car has been towed. Any of those would be appropriate, especially given our current situation. But there's the Baltimore thing. Where a black man was severely injured while in police custody. and later died. And then there's the gang stuff going on in Denver right now. There's a shooting almost every night. I cannot bear to leave my son standing on a corner. I cannot bear to imagine what might happen. Throw on my jeans at four in the morning and drive twenty minutes to downtown. Find my son sitting down, leaning against a building. Pull over and let him into the car. Drive around for thirty minutes and finally find his car. Discover that he really wasn't working, but was, instead out with friends. And so he called me. Phew! I survived thirty days of writing poetry with the incomparable Mary Lee Hahn and several others! Mary Lee wrote some incredible poems this month, and you should really head over to one of her blogs, YEAR OF READING or POETREPOSITORY, to read them. When I'm not writing (bad) poetry, I'm a teacher at a Dual Language school (English and Spanish) in Denver. (I'm not fluent in Spanish, not yet anyway, but I do speak enough to get by). We struggle constantly to find high quality materials in Spanish. Recently, I've come across two terrific new bilingual poetry books. Poet/artist Maya Christina Gonzalez fell in love with trees when she was thirteen, and moved from the desert to Oregon. 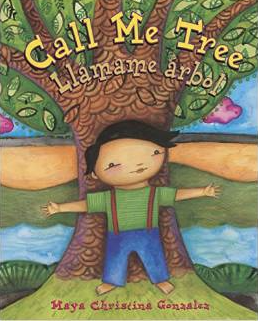 CALL ME TREE/LLAMAME ARBOL is an extended metaphor comparing the growth of a tree to the growth of a child. Each page includes a gorgeous illustration as well as several lines of the poem, in both English and Spanish. Young children will love the sound of the words, but it would also be a terrific book for studying extended metaphor with older students. Pat Mora has written many books-- two of my favorites are TOMAS AND THE LIBRARY LADY and ! Mmmm! Mmm! Qué Rico! (I apologize- Exclamation marks in Spanish are a little different, but Blogspot is being ugly this morning). 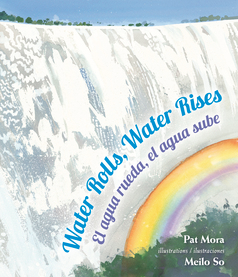 Pat's newest book celebrates the movement and power of water, around the world and through the seasons. Mora's poetry is accompanied by artwork by Meilo So (PALE MALE, WATER SINGS BLUE). End pages include not only a bilingual author's note, but also references to what part of the world served as the inspiration for the art. I love this! POETRY FRIDAY will be at SPACE CITY SCRIBES.